Eye On The Y is The Salt Lake Tribune’s weekly newsletter covering BYU athletics. Subscribe here. 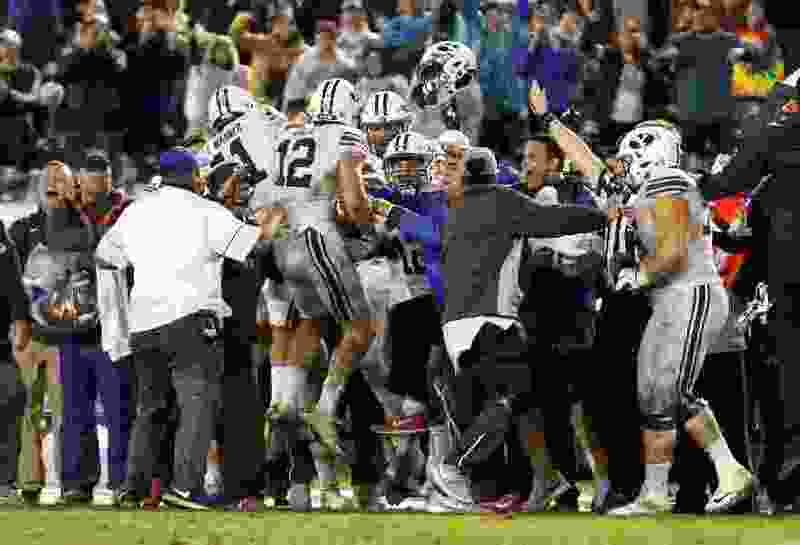 BYU has always known which bowl game it would go to if it became bowl-eligible since going independent in 2011 because it had agreements in place before the seasons started. Not this year, however, thanks to the Poinsettia Bowl folding in January of 2017. The Cougars were supposed to spend a week in San Diego in December of 2018, but that obviously won’t happen, unfortunately. Let the guessing game begin. That’s where the fun comes in. I’ve spent a lot of time the past week — since the Cougars fell 35-27 to Utah in the rivalry game to complete the regular season with a 6-6 record — trying to track down bowl directors and others to get a feel for where BYU might go bowling. I’ve learned that very few bowl directors return phone calls and/or emails, and those that do will not talk on the record. I’ve also learned that a couple bowls being mentioned by national media outlets as possibilities for the Cougars aren’t all that interested in BYU. The Walk-On’s Independence Bowl in Shreveport, La., the Bad Boy Mowers Gasparilla Bowl in Tampa, Fla., and the Redbox Bowl in Santa Clara, Calif., fall into that category. That’s not to say ESPN won’t ask them to get interested, however. Which bowls are most interested? • The Frisco Bowl on Dec. 19 at Toyota Stadium in Frisco against a Mid-American Conference (MAC) team. • The First Responder Bowl on Dec. 26 at the Cotton Bowl Stadium in Dallas against any of about a half-dozen candidates from Conference USA or the American Athletic Conference. • The Armed Forces Bowl on Dec. 22 in Fort Worth at Amon G. Carter Stadium against a Big 12 team (probably the least likely of the three). Several bowl directors said ESPN, which owns and/or operates 16 bowls, is calling all the shots, with some input from bowl directors and committees. And a lot depends on what happens in the AAC championship game Saturday between Memphis and Central Florida. If UCF wins, it will go to a New Year’s Six bowl game and free up a minor bowl spot for someone else. “In my mind, BYU fans should be UCF fans this weekend — because that opens up a spot, which is all-important,” said one bowl director. Another non-Texas bowl director said BYU seems to be most interested in playing in the Frisco Bowl, if it was “given its druthers.” He also added that the Cheez-It Bowl in Phoenix — formerly the Cactus Bowl — recently jumped into the mix as a possibility for BYU and might make a late push depending on what happens in the Pac-12 championship game. “Everybody in the business knows BYU sells tickets and brings eyeballs,” he said. But the Cougars can’t afford to be picky, even with its relationship with ESPN, several directors stressed. “It hurts and it is supposed to hurt, and that’s OK. We have another game to prepare for. We’re going to learn as much as we can from this. I think it is supposed to hurt. Luckily, we get this game early next year. We feel bad for the players and for our fans. But they have to wait less than a year to play against Utah again." • BYU’s women’s volleyball team drew a No. 4 seed for the NCAA tournament and will begin play in the Big Dance on Friday against Stony Brook in the Smith Fieldhouse. Utah is also in BYU’s bracket, and could face the Cougars on Saturday if it beats Denver on Friday and the Cougars down Stony Brook. • BYU’s gymnastics head coach Guard Young announced Wednesday that he has hired Leonid Matsyuk as a volunteer coach. Matsyuk was a reserve for the Ukraine Olympic Team from 1995-2000 and most recently has been a coach at USA Gymnastics World in Woods Cross. Better, he once performed for Ringling Bros. Circus. • BYU senior offensive lineman Austin Hoyt has accepted an invitation to play in the 94th East-West Shrine Game on Jan. 19, 2019 in St. Petersburg, Fla. The 6-foot-8 Hoyt started in 30 games and played in 50 for the Cougars and is a team captain this season.